GERTRUDE PAULSEN was born to Cornelius and Jennie (Ver Mulm) VerSluys on December 12, 1926 on a farm near Rock Valley, Iowa. At the age of 10, she moved with her family to a farm near Holland, Minnesota where she attended country school District #30 and later attended Central School District #72. Upon completion of her education, she began doing domestic work in the Holland and Pipestone, Minnesota area. On August 21, 1946, she was united in marriage to Alfred Paulsen in Sioux Falls, South Dakota. Following their marriage, they lived and farmed near Airlie, Minnesota for a short time. In the fall of 1947, they moved to Alfred’s mother’s farm west of Ihlen, Minnesota. In 1960, they purchased a farm west of Ihlen and moved there in 1962. After her divorce in 1977, Gertrude became employed at the Good Samaritan Village in Pipestone where she worked for three years. She also cleaned at the American Legion and later started cleaning at the Pipestone Dental Clinic where she worked for 16 years until retiring in 1994. Gertrude and Al remarried on February 26, 1995 in Hanley Falls, Minnesota. On July 5, 1997, Al preceded her in death. After his death, she continued to live on the farm until June, 1998, when she moved to Jasper, Minnesota. Gertrude moved to Dells Nursing and Rehab Center in Dell Rapids, South Dakota in December of 2016. Due to her declining health, Gertrude moved to the Pipestone County Hospice house in December of 2018. She remained there until her passing on Sunday, April 7, 2019 at the age of 92 years, three months, and 26 days. 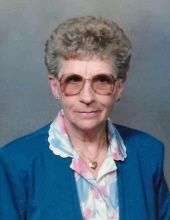 She was a member of the First Presbyterian Church in Pipestone where she had served as a deacon and on the hospitality group, and had taught Sunday School. She was also a member of the Holland Presbyterian Church while living near Holland. She enjoyed crocheting and made several large table cloths, as well as a large “Last Supper”. She also enjoyed having a large flower garden. For many years, she was known for the cakes she baked and decorated for weddings, confirmations, and graduations. Grateful for having shared her life with her are her daughter, Jean Anderson of Jasper, Minnesota; two grandchildren, David John of Jasper, Minnesota, and Jennifer Jo Ahrendt of Trent, South Dakota; two great-grandchildren, Taylor Shellum of Trent, South Dakota, and Paige Ahrendt of Jasper, Minnesota; two sisters, Matilda, Mrs. Louis Lange of Adrian, Minnesota, and Genneive, Mrs. Wilmer Kiecksee of Sherburn, Minnesota; and her special nephew, Bruce Watts of Taipei-Taiwan. She was preceded in death by her husband; her parents; one brother, William VerSluys; and a son-in-law, Lynn Anderson. To send flowers or a remembrance gift to the family of Gertrude Paulsen, please visit our Tribute Store. "Email Address" would like to share the life celebration of Gertrude Paulsen. Click on the "link" to go to share a favorite memory or leave a condolence message for the family.